The 6th World Youth Bridge Open Championship will be held at Milenij Grand Hotel 4 Opatijska Cvijeta Opatija, Croatia, 20-29 august 2019. The Format of the Championship consists of four events: World Pairs Championship – World Teams – Swiss/KO Championship – BAM Teams – World Individual. The Championship is open to all players born on or after 1st January 1994 (Juniors & Girls) or born on or after 1st January 1999 (Youngsters) or born on or after 1st January 2004 (Kids) in good standing with their own NBOs. Teams and Pairs must be made up of players from the same NBO. Players must be members (not necessarily nationals) of the Federation through which they enter. NBOs may send as many teams or pairs as they wish. In the event that an NBO is not able to arrange its own national representative team or pair, players may play with eligible partners/team mates from other countries of the same Zone and will play as representatives of that Zone. 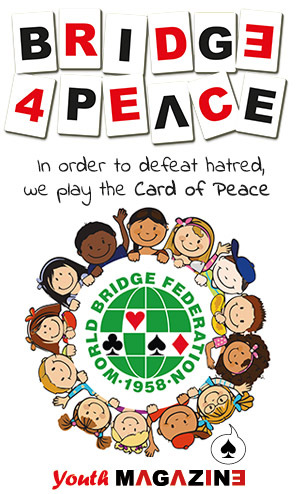 To be eligible for participation in the 2019 World Youth Open Bridge Championship all participants must comply with the WBF Laws and Rules & Regulations.